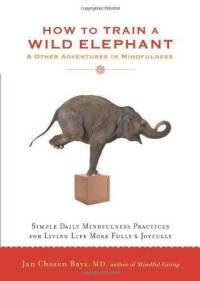 In an effort to become more 'mindful' of each day, I have embarked on a series of weekly exercises derived from the book, "How To Train a Wild Elephant" by Jan Chozen.- Last week's exercise was to use my non-dominant hand to complete basic daily tasks - Mindfulness Monday: Exercise #1. Exercise #1 - Use your non-dominant hand. Brushing my teeth, playing Angry Birds and blogging were time consuming and frustrating while using my left (non-dominant) hand but do-able. The exercise made me much more aware and strengthened my appreciation for my health and well-being. 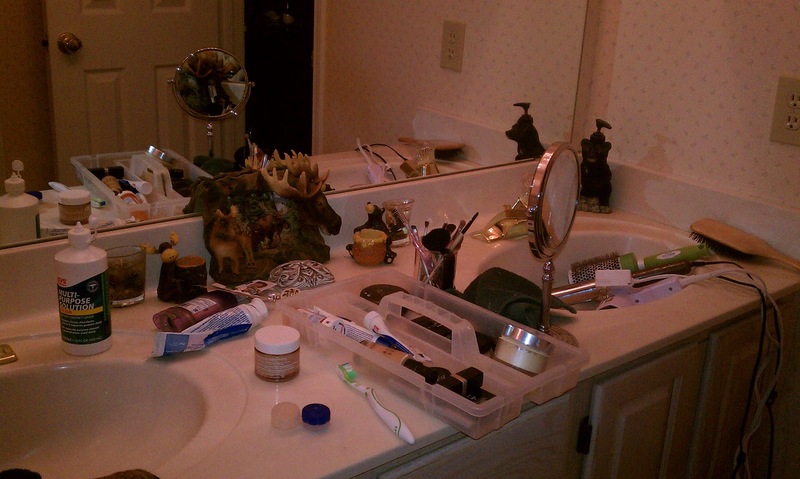 Exercise #2 - Leave No Trace: Choose one room in your house and leave no sign that you've been there. After I'm done trying not to look like Tammy Faye, the sink and counter are so cluttered with several different hairbrushes, a blow dryer, curling iron, hair products, contact lens stuff, make up and various skin care products that Mr. Something has been known to (ahem) take issue with the lack of space available to him. If anything, I'm thinking this exercise will at least promote bathroom harmony. It's great that you're trying the exercises. I also did those two, and it wasn't so much "what" I was trying to remember to do, but how my brain was spinning out until I caught myself and remembered to use my non-dominant hand (in my case, right) and to respect my things, my home, and my husband who has to live there, too (leave no trace). So I had a similar experience to yours on that second one. Keep going with the book! I have totally fallen off the face of the blog-earth, I swear. And I've missed reading your blog especially! It's funny that although I've not read the book, I too have been trying to do nearly the same thing in terms of leaving no trace that I've been there in my house. I started with just the bathroom, then added the living room and now the kitchen. Each night I make sure that before I go to bed, everything is put away and back in order. I don't have to be concerned about it being livable for anyone else, but it's so nice to wake up in the morning to tidy spaces around. Next up: my bedroom. UGH! Jennifer - Thanks for checking out "It's Always Something". Heather - I'm certain we are on the same psychic wavelength... Glad to see you're back!